Today, let’s have a look at two ways we use the auxiliary verb have in English grammar. You can have your watch repaired, or have someone repair your watch. Simple, right? Well, today I will show you both of these grammar patterns. I want to have my watch repaired. You can have your hair cut at that barber for just $10! I think I will have the house painted this fall. When we use this pattern, the object of the verb have receives some benefit from the PPVerb. In my examples above, my watch gets repaired, your hair gets cut and the house gets painted. This English grammar is generally used when we talk about hiring someone to perform a service for us. You usually pay to have your watch repaired, your hair cut, and your house painted. Notice too that these sentences do not say who is doing the repair, cut, or paint job. 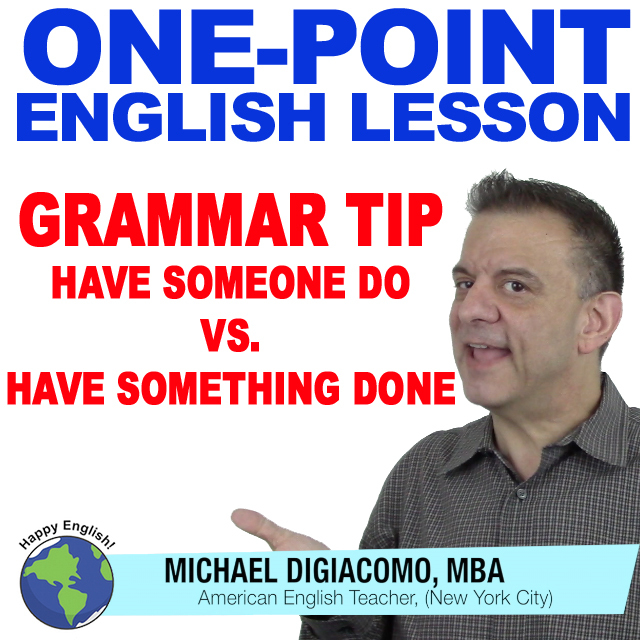 The person doing the action of the verb is not the main point. However, the result of the action is the main point. I want to have Bob repair my watch. You can have that barber cut your hair. He only charges $10! I think I will have Jack paint the house this fall. He does great work. In these examples, Bob is repairing, the barber is cutting, and Jack is painting. The person who is doing the action is main point. We generally use this grammar when we want to say we asked someone to do something. Again, the main point is the person doing the job. Have you had something repaired recently? Have you had someone do something for you? Use the comment box below and try writing some example sentences with these patterns!